For a while now the sheer number of applications available in the iPhone App Store has been somewhat of a source of pride for iPhone users. It handsomely outnumbered the Android Market. That might however change in the next couple of months as the gap between two app stores is narrowing pretty rapidly. 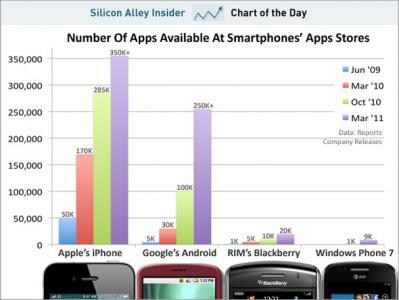 Apple App store currently has 350,000 applications compared to Android’s 250,000. That would seem like a big difference initially but if you look closely from Oct 2010 the Apple App store has had an increment of 65000 apps where as the Android Market place has had an increment of a 150,000 apps. Whichever way you look at it or whatever reasoning there may be for this, no one can deny that it’s a massive difference. The app growth rate for Apple seems to be slowing down where as its the opposite for Android. It wouldn’t be completely insane right now to imagine Android surpassing Apple in this regard in the next couple of months. A thought like this one year ago would have been unfathomable.